William Hill have Australian horse racing covered. 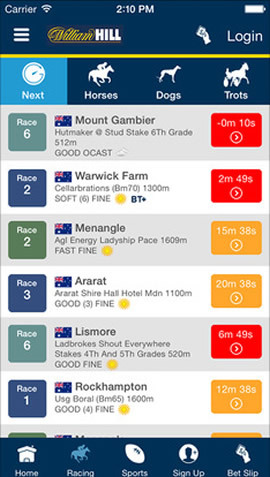 Wager on any thoroughbred or harness race in Australia or worldwide from your smartphone. William Hill Australia was formerly known as SportingBet. Formerly known as SportingBet until it was rebranded as William Hill Australia. Wager on thoroughbred, harness/trot racing from every Australian racetrack. 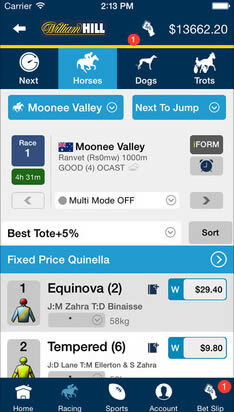 ​Bet options include Win/Place, Quinella, Exacta, Trifecta, First 4 and Exotica. Bet on racing from Victoria, New South Wales, Queensland, Tasmania & more. William Hill is a brand that is synonymous with online betting. The company have been around for decades and many state they are in fact the oldest bookmaker in the world. For a company to be at the top of their industry for so long is almost unheard of in the modern world. As times change it’s often tough for the bigger players to move forward and start to plan a future outside of the comfort zone that has got them to where they are now. William Hill is definitely not one of these companies. One of the ways in which they have kept up with the competition, and in some cases overtaken it, is by introducing their punters to the world of mobile betting. We aren’t saying that William Hill were the first bookmaker to go mobile, but they have recognised that this is the future of online betting and as a result managed to produce one of the best betting apps in the industry. What we are going to be looking at today is how their horse racing section fairs up against the competition. As you will likely already be aware, horse racing is one of the most popular sports in Australia, so it’s vitally important for any company targeting the Australian market that the sport gets the coverage it demands. The first thing you are going to notice from the app is that horse racing is all over it. From the minute you enter the homepage you will be able to see the next upcoming races and even able to bet directly from this section of the app. The homepage also allows you to scroll over the next half a dozen or so races that the app is running. For each race they will highlight the three favourites and then from there you can click the ‘View Full Racecard’ to get more information on the remaining filed. The main horse racing section though can be accessed from the top nav bar. Once in the left hand side sidebar is the best place to start with options that include daily races, feature racing, promotions, results and jockey/trainer information. The daily races tab allows you to see all the races that are upcoming for that days racing. You can click the race you want to view the race card for or simply scroll down to see the full list. After selecting your race, the right side bar then gives you the run down on which horses you can back. Obviously at this point you are able to choose the price that you want to take and it will be added to your betting slip. A nice feature in this section is the ability to click on each horse and then find out a bit of information about the horses form. Granted, this section possibly isn’t as deep as some bookmakers have it, but it’s a nice addition nonetheless. The downside to this is that it loads up in your browser, outside of your app. Not a problem for some, but it’s frustrating that it’s not integrated into the app as you then will have to load the app back up and lose the position you were in originally. The promotions tab is one that you should be checking out fairly regularly on the app. It will be targeted towards horse racing promotions and it often leads to some nice value to be had. Granted, the promotions do range in terms of how lucrative they are, but you can expect everything from price enhancements, money back offers and also bonuses for your horse racing betting. The app can be accessed directly from the App Store for users within Australia. It’s completely free to download and shouldn’t take more than a couple of minutes. What’s great about the app is that you can access it without registering an account to start with to familiarise yourself with the surroundings. We can almost guarantee that once you’ve had a bit of a look, you’re going to want to download it. 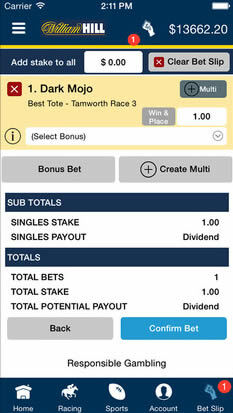 Alternatively, the app can be accessed by simply visiting the William Hill site via your mobile browser. As with most sites these days, the site will recognise that you are on a mobile device and forward you to their mobile site instead. From here you can add it to your home screen and use it exactly as you would a regular app. 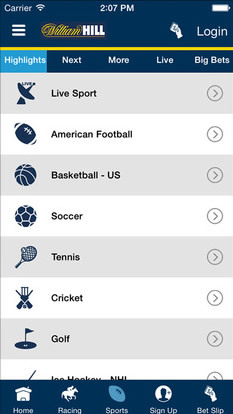 There was a lot to like within the William Hill horse racing section of their betting app. First thing is their design and just how good it looks on both tablet and smartphones. Whilst this review used mainly the iPad, we have tested it on Android and iPhone devices both with excellent looks and feel. At no point does the app ever feel cramped and it was one that felt responsive throughout. There were times where it took a while for some pages to load and even markets to update, and the app did crash once, but this could literally be down to the device more than the app itself. The horse racing section is about as in-depth as you’re going to come across. It’s a really cracking little addition and the number of meetings and markets that you can bet on is really quite impressive. 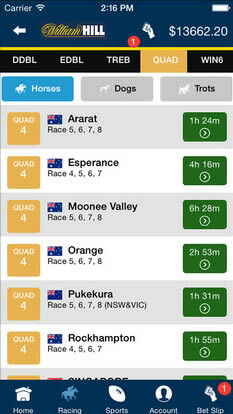 The ability to check your horse’s form whilst on the app was also a nice addition, even if it did load in the browser. There are very few downsides in all honesty, but one thing that we did notice was missing was the lack of live streaming. We only really mention this as we know their UK horse racing section does allow for you to stream racing live if you’ve wagered on that bet. The inclusion of the live streaming would probably have been the cherry on this already extremely tasty cake! Reviews of the other top Australian racebook apps.